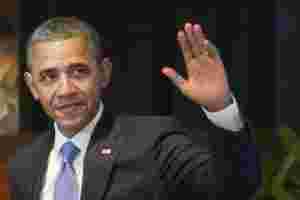 Washington/Honolulu: US President Barack Obama urged lawmakers on Sunday to “bite the bullet" and make the compromises needed for a deficit-reduction deal they need to reach this month to avoid triggering automatic federal spending cuts. At a news conference in Honolulu, where he was hosting a summit of Asia-Pacific leaders, Obama said it was time for the bipartisan, 12-member “super committee" to match up prudent spending curbs with tax increases and get to an agreement. “My hope is that over the next several days the congressional leadership on the super committee will go ahead and bite the bullet and do what needs to be done." The special congressional committee is assigned the task of finding at least $1.2 trillion in federal budget savings over 10 years, but with a 23 November deadline looming, Republicans and Democrats on the panel have not yet sealed a deal. Republicans have been reluctant to accept tax increases, and Democrats do not want to agree to cuts in healthcare and retirement programs until tax increases are on the table. House of Representatives Democrat James Clyburn, a member of the committee, said on the TV program “Fox News Sunday" that while he was “very hopeful" that a compromise could be reached by the deadline, “I am not as certain as I was 10 days ago." Clyburn added: “I really believe that all of the ingredients for a good resolution are there. We just need to build the will." Lawmakers said they had not given up on reaching an agreement by the deadline despite the challenges involved. “It’s been a roller-coaster ride," committee co-chair and House Republican Jeb Hensarling said on CNN’s “State of the Union" program on Sunday. “We haven’t given up hope, but if this was easy the president of the United States and the speaker of the House would have gotten it done themselves," he said. Obama, a Democrat, presented broad recommendations to the committee in September but then stepped back from the process, unlike in the summer when he was directly engaged in fractious talks over raising the US debt ceiling. Disagreements over taxes dominated those negotiations and soured relations between Obama and House Speaker John Boehner, the top Republican in Congress. On Sunday, Hensarling acknowledged that tax increases would likely have to be part of any bipartisan deal. “We believe that, frankly, increasing tax revenues could hurt the economy, but within the context of a bipartisan negotiation with Democrats, clearly they are a reality," Hensarling said. The deadline for the six Democrats and six Republicans to reach an agreement is less than two weeks away. Once a deal is reached, Congress will have until 23 December to vote on the committee’s recommendations. If either deadline goes unmet, automatic spending cuts would be triggered on domestic and military programs, beginning in 2013, as part of a law enacted in August. Obama spoke on Friday by telephone with the super committee co-chairs -- Democratic Senator Patty Murray and Hensarling -- to urge that the panel meet the deadline. The White House has said that Obama would block any measures to water down the enforcement mechanism that would require the $1.2 trillion in automatic spending cuts over 10 years if the committee fails to reach a deal. “The clock is running out, but it hasn’t run out yet. We still have time, but we have no time to waste," Republican Senator Patrick Toomey, a member of the committee, said on “Fox News Sunday." “It’s at a difficult point. I think we’ve got a ways to go, but I hope we can close that gap very quickly," he said.